Imagine the dust, dirt and back-breaking toil of working in a coal mine. Then consider the potential of this fossil fuel – the warmth and the energy produced from it. Think of the wealth and riches that coal brought to mine owners, then the hardship and poverty heaped upon entire rural communities when the mines ceased to be profitable and were closed down. These images, these dilemmas, lie at the heart of a group of paintings by local artist Gary Blundell, who struggles with the ‘heaven and hell’ of coal mining in his exhibition, Bituminous Illuminations. Showing at the Rails End Gallery in Haliburton Village until Oct. 12, before being shipped to the United Kingdom for a year-long international tour, the exhibition is the culmination of four years of work for Blundell. His collection of 23 paintings was produced following an artistic residency in Yorkshire, England, in 2011 and 18 of them are currently on display at the Rails End Gallery. While in the UK, Blundell visited a number of mines – some working, others now derelict – and was captivated by the textural beauty of these harsh environments, scarred by our insatiable quest for fuel. However, as he walked the mines, often deep underground, Blundell was also struck by the light cast by his head lamp. His paintings portray the scarred floors and walls, the drainage ditches and cart tracks hewn from the once coal-rich strata of the Yorkshire mines. Equally they capture the more ethereal sentiment in Blundell’s mind, their lines often receding to vanishing point in exhaustingly beautiful works that speak of the hardships endured by those who worked there just as much as they depict the physical aesthetics of the places themselves. As such, the deep grooves that Blundell cuts into his wooden canvases serve to accentuate the textural beauty of his oil on wood works, making viewers want to feel as well as look at the paintings. The result is a body of work that is powerful and emotive in an exhibition wonderfully suited to the heritage atmosphere of the Rails End Gallery. For more information about the exhibition and artist go to www.railsendgallery.com and www.hotspurstudio.com. I was expecting a show by an accomplished painter, but I wasn’t expecting a meditation on the history of chalk and coal mining in England. Gary Blundell’s striking relief paintings are on exhibition at the Visual Arts Centre of Clarington until June 24th. Blundell and his partner Victoria Ward live and work at Hotspur Studio, a log cabin near Gooderham and I’ve enjoyed watching the work of these two intrepid painters evolve over the years. Work informed by the landscape is an apt term here, but Blundell and Ward travel extensively beyond the Canadian shield to the wildness of places like Newfoundland, Iceland and England to explore their geographies. The light is especially engaging on the upper floor where “Coal” is hung. With exposed beams and cement walls, it isn’t ideal for displaying large work, yet the industrial ambiance of the space more than makes up for it. In fact this black and white collection of Blundell’s work has the most impact. In addition to the solemn paintings was poignant and engaging documentation – maps, drawings, clippings, photos, diagrams, notated photocopies of the history of the mining industry in Yorkshire, revealing some of the thought process that went into the show. And a soundtrack – a Welsh male choir and the chipping, hollow hacking sounds of miners underground. For some time, I found myself in a state of quiet being with the paintings rather than simply viewing them – the best way to experience art. It’s important to note the significance of a having a space conducive to experiencing an art show of this caliber. The Visual Arts Centre of Clarington is a barley mill that has been beautifully renovated to accommodate 3 galleries and a middle floor of studio space, less than an hour’s drive from Peterborough. Its expansive wall space and light do justice to contemporary art installations such as this one. 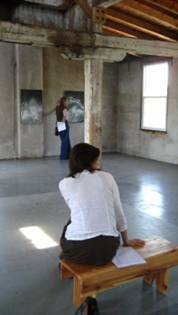 There is still time to catch the Artist Talk, June 24th at 2pm or see the show before it heads across the pond. 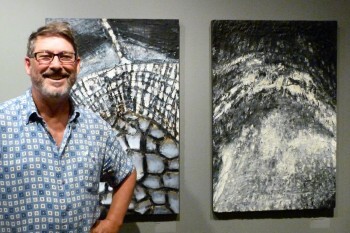 The abstract relief painting of Gary Blundell appears initially to have nothing in common with the pristine realism of Doherty or Watts and , although his expressive technique and style are far removed from painterly realism, his attention to the detail of the natural world in its most physical sense brings us closer to a geological representation of the world. A strong sense of composition, colour and form - build up by his thoughtful manipulation of plywood, plaster, and paint - enables the viewer to step into Blundell's world, where man intervenes to change nature. Gary Blundell is a geologist by training, but a cartographer by artistic impulse. His attempt to chart the vast geological diversity of the Sudbury region in an untraditional abstract series of works is on display at the Art Gallery of Sudbury. These are intriguing pieces that incorporate a surprising range of colours, presenting an unusual beauty in their idiosyncratic features. Blundell's works are threaded together by geometric patterns partly shaped by horizontal and vertical lines routered into the surface of plywood panels. There is a tendency for interest to wane quickly as a result of the apparent sameness of these mainly abstract interpretations, most of which follow a prescribed pattern of blocks accumulating upon and around each other like cells in an organic structure. But this is a superficial perception that fades after a more considered contemplation of their individual characteristics, many of which envision the vitality of a subject mistakenly seen as inert and lifeless - rock! Crow flight Minerals, for example, is an oil-on-wood interpretation of a rock surface that blazes with colour diversity and unique geometric configuration. A series of long, thin rocks stand perpendicular to each other, dominating the centre. Larger rocks, each uniquely shaped, appear to move out from this clustered periphery, illuminated by firey reds in some and shades of gold in others. Rational materialists would scoff at the idea of rock imbued with a life force. Others might hold a different view. Theosophists and others sharing similar metaphysical viewpoints consider the mineral kingdom to have consciousness, a decidedly controversial, but intriguing, and even inflammatory notion in an area where we depend so much on the extraction and manipulation of minerals. There is no evidence that Blundell shares this view, but his animated interpretations of this regions crustaceans, each stamped with his unique imprimaturs, do bring to mind alternative ideas about Sudbury's rock - inescapable , beautiful and integral to our history. Indeed, the relationship between its eternal presence and human activity is never from out attention in these works. Connection to the literal bedrock of our existence is an interpretive exercise that Blundell conveys with an ambiguity mirroring his own ambivalence about Sudbury's mining history and the huge consequences for the lay of the land. In Edge, a shuddering reaction is evoked by a forbidding image of what looks like the cold dominion of an industrial landscape. There are the characteristic geometric lines that divide the image into rows of rectangular shapes. But then there is the horizon line, a deathly black streak above which blood red strokes fill the sky. It has the power to evoke images or a hellish order as well as awe. The power of human industry to create and simultaneously destroy is never far from the horizon of our awareness. In yet another work, Embarkation invites us to linger on the details of place and movement. This visually charged image is a layered, subterranean illustration that dances with rich contrasts. Daring brushstrokes of strong reds and yellows streak across the surface of geological formations separated by much darker tones, their shapes indeterminate, yet fully alive in their appearance of motion that flows across the display. It’s time to rock on at the Cornwall Regional Art Gallery. A new exhibit by E. G. Blundell, who actually has a degree in Earth Sciences, is a collection fo unique paintings with a three-dimensional touch – literally. The collection, 40 Years of Rock – opens today and runs until Sept. 21 at the Gallery, 168 Pitt Street. A reception, with the artist in attendance, will take place at the gallery today at 7 p.m. The general public is welcome to attend. Blundell sculpts large sheets of plywood, then uses rich oil paints to create his works. Rejecting a traditional approach to landscape painting, he believes high realism and abstraction are one and the same. He was born in England, but immigrated with his family to Canada in 1962. A graduate of the University of Waterloo, the self taught artist began painting as a way of expressing his feelings of the Canadian landscape. He spends a part of each year traveling throughout the country, making sketch and visual records of his journey. Back in the studio, he words them into large, vivid art works. Instead of depicting a site visually, he expresses his impression of a particular place through textures and colours. Blundell has been artist in residence for educational institutions in both Newfoundland and Iceland. “Half of his show is inspired by these scenes of Iceland and Newfoundland,” said Lizotte. 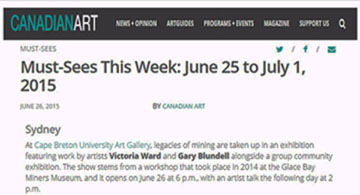 This is Blundell’s first exhibit at the city gallery , however his list of credentials includes the McMichael Collection of Art, the V. Macdonnell Gallery, BUSgallery and Joseph D. Carrier Gallery’s in Toronto. The focus of Toronto artist, Gary Blundell, is to promote an interest in the natural world through his uniquely textured art. Blundell uses sheets of plywood, oil paint and a router to create large, extra-dimensional works of art that express his deep love and appreciation for nature. By using the special technique of gouging, Blundell’s art takes trees, rocks and land forms into a realm beyond the two dimensional, His pieces range from semi-abstract interpretations of Canada’s rugged wilderness, to the subtlety of the microcosm: barnacles, fungi and lichens. Blundell believes that people often appreciate the wonder of grand landscapes while ignoring the intricate beauty of nature at their feet. It is this abstract quality of nature that he endeavours to capture in his work. Gary moved from England to Canada, with his family, in 1962. It was this early introduction to the Canadian wilderness which kindled his passion for nature. After graduating with a Bachelor of Science degree in Earth Sciences in 1983, he began painting. Initially his focus was on landscapes, but his travels across Canada engendered a deep appreciation for the beauty and rugged texture of the land. Blundell’s sense of protection for the environment continued to grow and he ultimately became an Environmental Consultant, his chosen profession for the last four years. He has also worked for eco-friendly groups such as The Sierra Club of Canada, The World Wildlife Fund and The Endangered Species Coalition. Toronto landscape painter Gary Blundell knows a thing or two about rocks. In describing his work he marries geological buzz words – like fissures, fractures, glacial deposits, deltaic features – with an artist’s vernacular. This fusion of art and science dominates his bold and vivid paintings that grace the pages of recent issues of Canadian art mag Vie Des Art and the cover of eco-zine Wildflower. No surprise Blundell’s business card bills him as Environmental Consultant/Artist. From childhood rock collecting Blundell moved easily to a degree in geological engineering from the University of Waterloo. “I was much more interested in the aesthetics of what I was learning rather than the practical applications,” he says. Blundell returns briefly to his hometown for a showing of his work at Gamma Ray Productions Gallery (494 ½ Somerset West), on view until May 2. Studying landscape painting under Ottawa artist Ian Hobson, Blundell took weekend trips to Lake Superior, Algoma with Gamma Ray colleagues and later with Toronto-based Bay Woodyard and pals. To expand his geographical horizons, Blundell journeyed to the Maritimes on sketching trips. His most recent – a two month trek last summer – fueled (sic) eight months of studio painting and a half dozen gallery shows. His large (3’x 4’) landscape painting incorporate a modified version of a technique pioneered by Canadian landscape painter Paterson Ewen – a supporter of Blundell’s work. Using rough-textured plywood boards, Blundell gouges out areas of wood with a router. The defined space is transformed into images of the earth, sea and sky in a manner. In his Bay of Fundy series, terracotta rock faces rise form the swirling blue waters of the Bay of Fundy’s tide-land drainage area paintings. Blundell’s powerful palette is also infused with light. Acid-green lichen covers the red-orange rock of the Cape Breton Highlands. The cold waters off Newfoundland’s North Peninsula are all brooding blues and blacks, capped in white. Blundell has worked as an artist and an Environmental Consultant since the mid 1990’s. Although he has his degree in Geotechnical Earth Sciences, he shares a love for art, splitting his time between these two passions. As an artist he is self taught yet his works, much like the layering of the earth’s surfaces, are as close to a relief painting as is the rock faces he depicts. Blundell admits: “I was much more interested in the aesthetics of what I was learning than the practical applications.” He has a fondness for the work of Paterson Ewen and has adapted a technique reminiscent of his painting style. Blundell uses rough textured plywood boards and with a router, gouges out the layers of laminate to create images of the earth, sea and sky. He then paints these panels, not with brushes, but with putty knives and removes the excess with rags. The paintings are moulded as much as painted. His colours are vivid and the final works emanate a presence that seems to be cut from the very surfaces they depict. It is in painting close observations of nature’s abstract images, where Blundell is most successful. Initially created like traditional artworks, with a preliminary sketch and rough drawing, the creating process then takes over and Blundell gouges, pushes and manipulates his panels until the desire resulted is obtained. The Serpent Rock Face is the most abstract of the three works on display. The gouged surface and repetition of shapes form undulating patterns across the painting surface. Not only does he record this rock face, he actually renders it, mirroring the intricate marking of a snake. We can see the interdependent nature of the environment resonated in this image. Blundell’s work is not easy to absorb or interpret. His painting are raw and his technique primitive, a contrast to the refined, precise application of paint by Bateman, Danby, Ross and even the tranquility of the pastels of Kozowyk. Blundell, on the other hand, is crude and deliberate in his process. The geologist come painter is most at home unearthing his nature paintings instead of merely recording them, paint to canvas. Fragile Embrace: Reflections on the Environment is the rather fuzzy title of the Burlington Art Centre’s blockbuster summer show. Te exhibition purports to ‘celebrate the wonders of nature, reflect on the fragile condition of the earth’s ecology and examine the relationship between man, society and the natural world.” And it includes works by Robert Bateman, Gary Blundell, Ken Danby, Martha Henrickson, Akira Komoto, Patricia Kozowyk, Stephen Scott Patterson, E. Robert Ross, Alan Sonfist and Lorne Wagman. Some may see Gary Blundell's landscapes as un-Canadian. But it's not because they are not suitably deferential - Blundell is certainly all reverence when it comes to the craggy mysteries of the Canadian landscape. Rather, the blasphemy comes in his rejection of what has become the typical perspective of Canadien when it comes to landscape painting. Blundell does not produce the usual broad Canadian vistas being taken in from a distance by an imaginary master of the land. Instead, the artist plunges right into the scene, embracing the perspective of a lover - he is up close and very personal. It's as if he hovers inches away from the subject of his observations. A cursory glance at the 18 works on wood and on paper underscores the radical departure this alone makes from what we have come to expect to see when we look at paintings of the Canadian landscape. Blundells' background as a geologist makes itself felt in his work, especially in the works on wood. Using routers of various kinds to gouge, carve and score plywood boards before painting them. Blundell manages to create an extraordinary sense of volume. Seen from a distance and up close from various angles, the textures reproduce the roughness and rawness of the natural world. These large wood pieces ma well have been easier to create because Blundell did not have to create multi-layered three-dimensional spaces on two-dimensional surfaces. On this level, the works on paper are far less successful. Blundell is still mastering the art of creating volume on paper. While it is understandable he would use sheets of plexi-glass to cover the works for their protection, these glossy, smooth visual barriers definitely detract from Blundell's cause. Shroud-like, the plastic wipes out all the textures and illusions of depth Blundell may have created. Hanging them on the wall opposite the wood pieces further underscores this difference. Perhaps it is the change in medium that led to the works on wood becoming truly abstractions (i.e. entirely non-representative of any recognizable natural form); whereas, in many of the works on paper, Blundell uses the same style but the resulting subject is identifiable. Interestingly, each medium appears to have generated a markedly different palette, Blundell's investigations and experiments with colour take flight in the paper works. In the wood pieces , he sticks mostly to what most would typify as "natural colours" - oranges, browns, greys, blues, yellows and grey-turquoise colours as well as white and black. On paper, suddenly Blundell's imagination gets "coloured in" - does he realize finally almost every colour we can possibly imagine exists already somewhere in the natural world? Perhaps, for instance, this is what inspired his bright fuchsia shadows, which spill back around the edge of a group of rocks. The ease of executing colour transitions on a smoother surface may well form the underpinnings to this distinction. Blundell is a former arstist-in-residence at the Pouch Cove Foundation in Newfoundland. This summer he will head for what should be an engaging experience - a summer residency in Iceland.